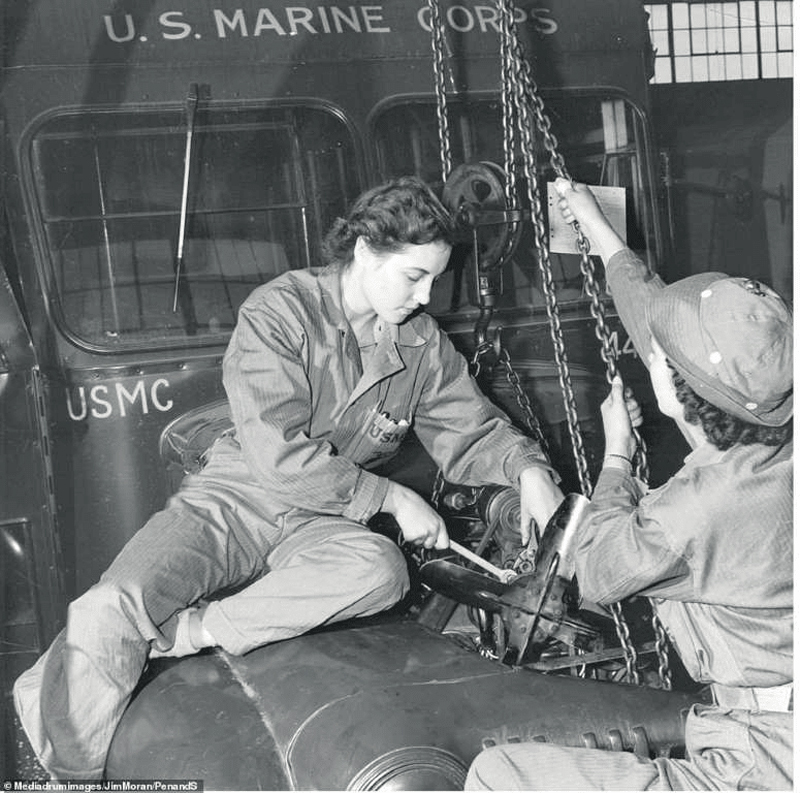 A Marine winches an engine from the hood of a truck, while another works on the motor with a wrench, as females were taught the tasks which had been traditionally considered the occupations of men. The women were trained at Mount Holyoke College in South Hadley, Massachusetts before being sent out. Much of their training was conducted entirely by female naval staff, but their drill training was handled by male drill instructors, who were notoriously hostile to the new recruits. 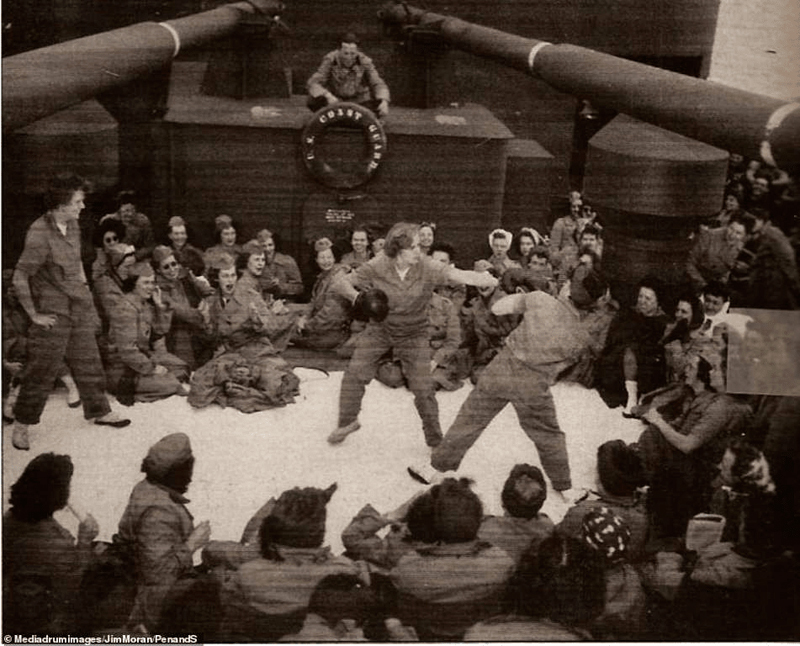 A boxing match takes place in makeshift ring between two Marines on-board a ship that is transporting the Corps to Hawaii. For their recreational activities, including sports and field outings, the women wore their 'peanut suits', so called for its tan color, a one piece seersucker ensemble. When they were not exercising the women wore long skirts and covered their legs, in keeping with the strict gender customs of the time. 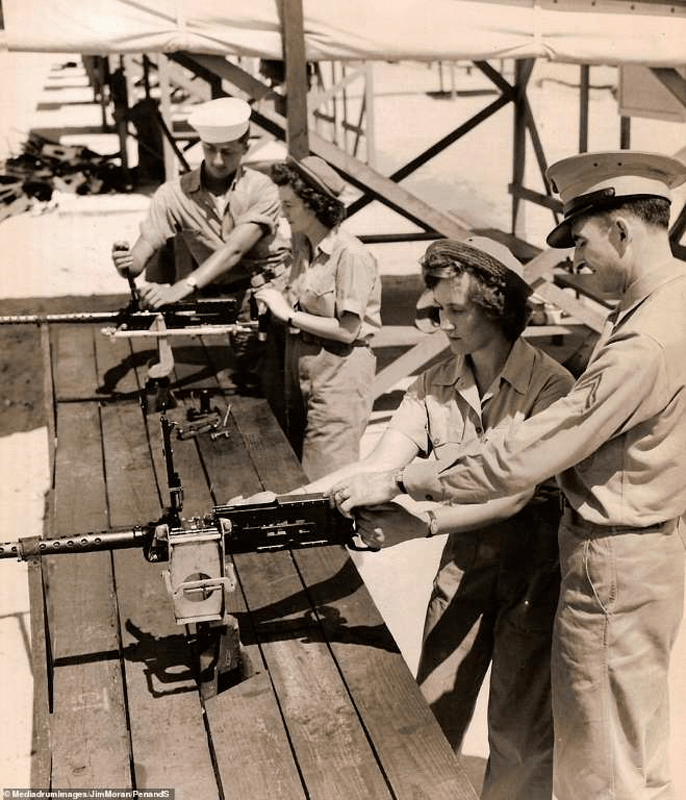 Female Marines are taught how to load and fire heavy machine guns during aerial gunnery training. If the enemy ever attacked, the Americans would be relying on their women to return fire from their battle stations. In addition to weaponry, the women were taught history, strategy and military law, to enable them to become great fighters. Put through their paces: The women's training was no different than the men's. Between February 1943 and September 1946 a total of 18 female Marines were killed - most of whom tragically in off-duty motoring accidents, just three while performing their duty. However, their value was soon greatly appreciated by the men who eventually became extremely protective of the new recruits, taking great care in their training of the women. 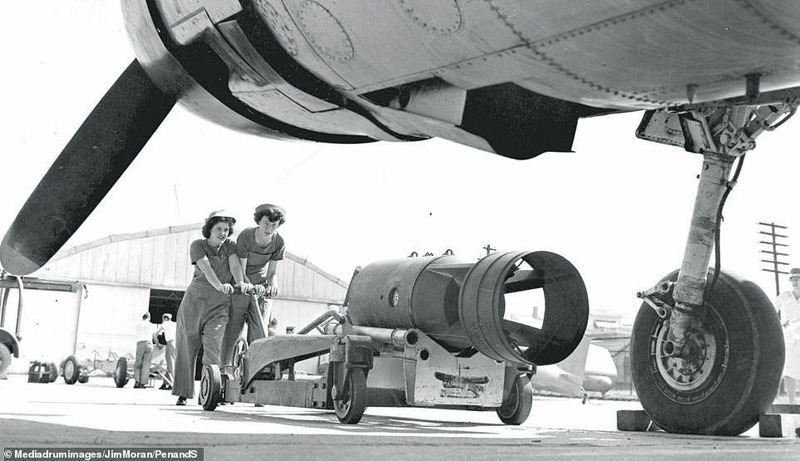 Female Marines load a bomber at a US airbase. By the end of 1943 Major General Thomas Halcomb has conceded: 'Like most Marines, when the matter first came up I didn't believe women could serve any useful purpose in the Marine Corps … Since then I've changed my mind.' 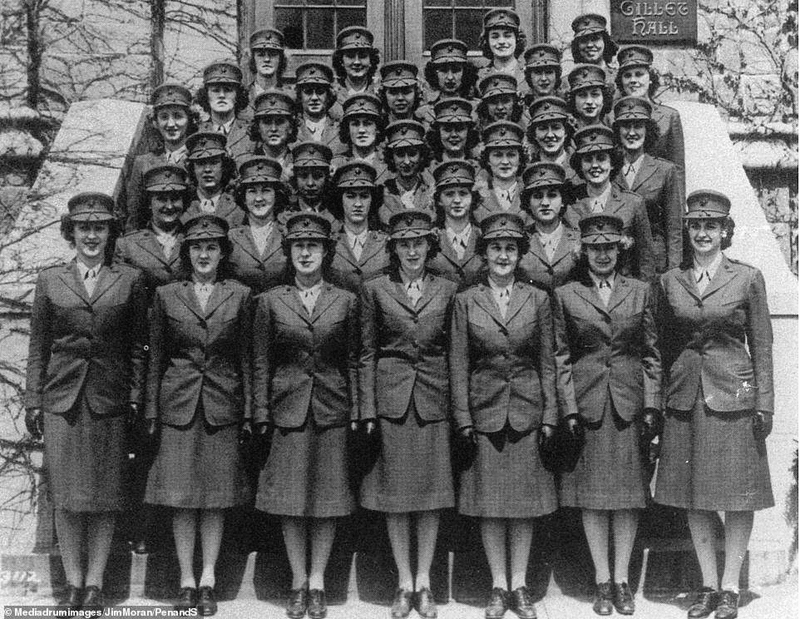 The Women's Reserve performed more than 200 military assignments including positions as clerical workers, parachute riggers, mechanics, radio operators, mapmakers, aviation mechanics and welders. 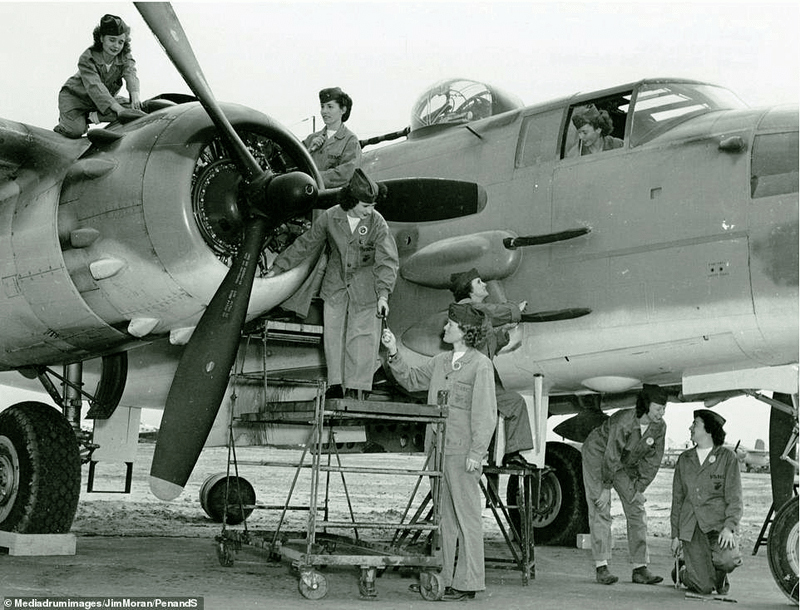 A number of Aviation Mechanics from the Marine Corps Women's Reserve are pictured ensuring that the United States' airforce planes were in prime condition. As a few work on the engine, three other inspect the fuselage and one of the women carries out checks from the cockpit of a bomber during WWII. Marines landing in Hawaii to relieve men for combat duty. Over the course of the War, hundreds of female Marines relieved male Marines from clerical billets at Headquarters Marine Corps, enabling them to fight in France. 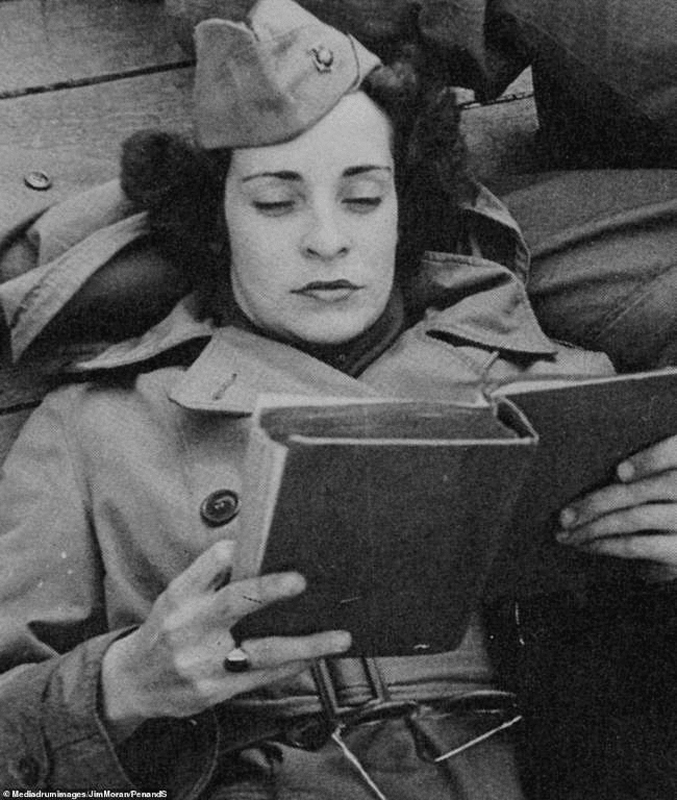 Private First Class Edith Macias recalled: 'The men did not look down or frown upon us, actually they were glad to have us. We were given a job to do and we did it. We were definitely not considered decorative rather than practical, but were treated as professionals'. Some of the 20,000 women reservists who answered the call to 'free a man to fight' - releasing urgently needed male marines for combat duty on the front line. 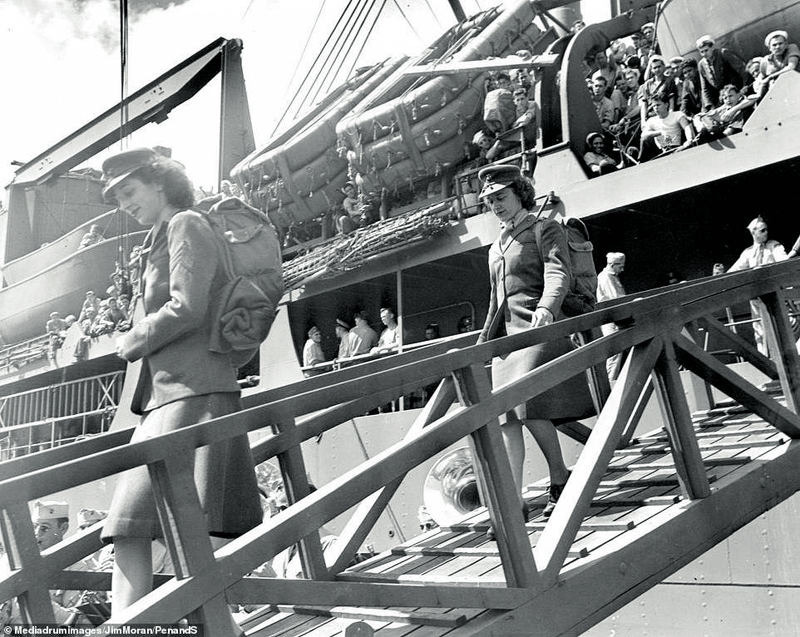 At the end of the war the women's unit was demobilized, with numbers slashed to around 12,000 members in December 1945 and cut by a further 2,000 for each month after that. As rumors circulated the army was considering changing their policy on women, the cuts were slowed and hundreds of the women applied to stay on. 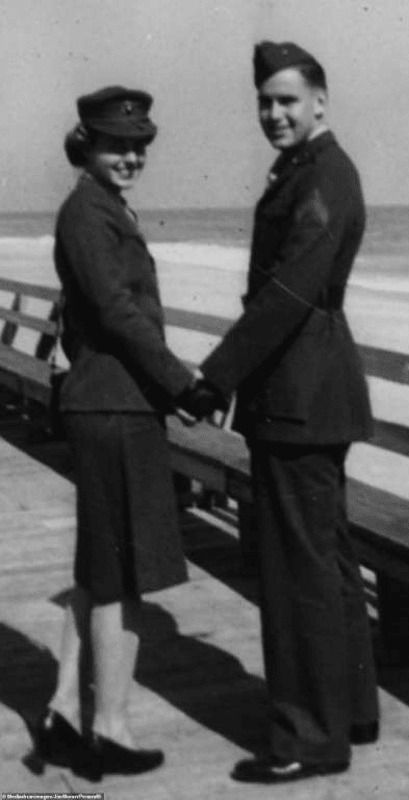 Two Marines, Lillian Marie Sandy and Joe Mittelsdorf, who fell in love after meeting during their war duties. Many of the women were seen as prize catches for the men on base. Corporal Louise Hedtler said: 'Any fellow was proud to take out a female Marine Reserve'. Marine Lillian Marie Sandy dons mens dunagrees as the female equivalent were too lightweight for her work as an automobile mechanic. 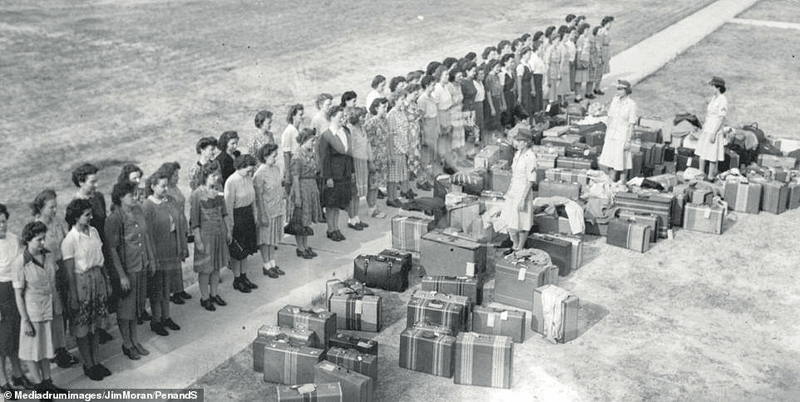 After the war the women were provided the full benefits that were legislated for their male counterparts - which included the coveted burial at Arlington National Cemetery, insurance packages, compensation and a bonus of $60 on their discharge. Some of the very first group of women to sign up for the Marines in the Second World War stand proudly in uniform. The uniform was green and consisted of a skirt, no higher than the kneecap, a jacket with three bronze buttons and a green cap trimmed with a scarlet cord. 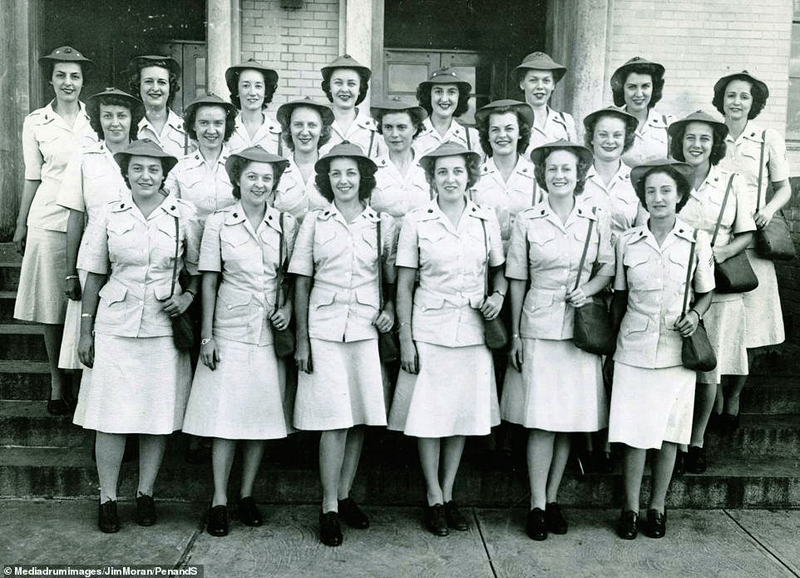 A small cohort of women who were thought to look 'particularly sharp' in their uniforms were used as messengers to go throughout the headquarters and pass on various communications. 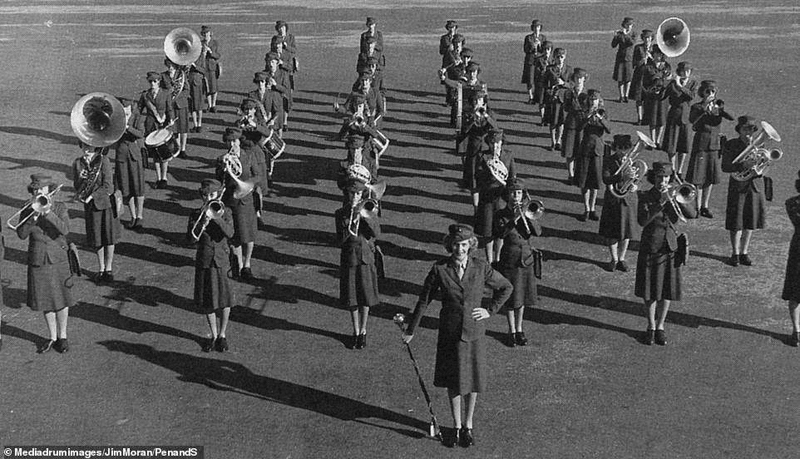 The Marine Corps Women's Reserve Band were renowned as the most outstanding female band in the United States, following in the footsteps of the men's band, which was established by act of Congress in 1798, making it the oldest professional musical organization in the country. By June 1944, women reservists made up 85 percent of the enlisted personnel on duty at Headquarters Marine Corps and almost two-thirds of the personnel manning all major posts and stations in the United States and Hawaii. Their duties including filling positions as parachute riggers, mechanics, radio operators, mapmakers, aviation mechanics and welders.